Executive Pool Home in Aviation Community! Hidden Lake Estates is home to this ranch-style residence that stands on a sprawling corner, 1.37-acre lot. 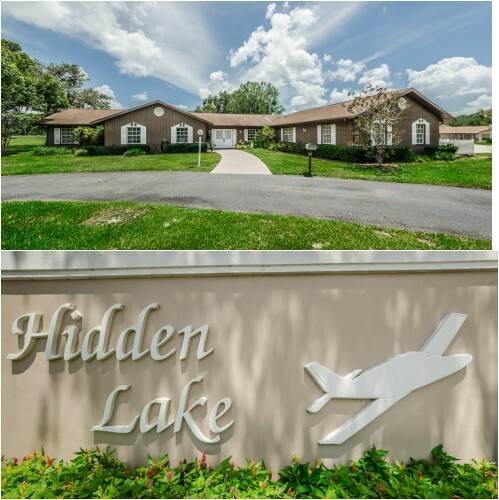 Nestled in this private and gated aviation community featuring paved and lighted 3400-foot runway (airport FA40), the home boasts 3630 square feet of living space. There’s plenty of room on your property to build an airplane hangar should you so desire enabling you to land and taxi to your front door. With 3 bedrooms, 3 full baths, and 3-car garage, there is tons of space to put your design stamp on this unique ranch. The sunken living room lends old-world style with sliders to the huge outdoor entertainment area’s screened-in pool, shaded dining area cooled by ceiling fans, and a luxurious Jacuzzi; all surrounded in lush greenery. With the position of the formal dining room and the tiled foyer that spans both rooms, simple furniture arrangement transforms the space into an expansive Great Room with eye-catching impact. The family room is large enough to feature an imposing brick-face fireplace, balanced by quadruple sliders to the stunning lanai, and a double-sided aquarium wall with views through to the sunny breakfast area. A casual dining bar that seats four is alongside a center island with storage to frame the airy kitchen that bursts with natural light. With a master suite featuring an over-sized bedroom, dressing area, step-up soaking tub, separate shower, and set of sliders to the pool–discover your own piece of paradise. https://trinityeastlakerealestate.com/wp-content/uploads/2018/03/LC-WebLogo-340x156-300x138.png 0 0 loricrawford https://trinityeastlakerealestate.com/wp-content/uploads/2018/03/LC-WebLogo-340x156-300x138.png loricrawford2017-08-03 06:35:082017-08-03 06:35:24Executive Pool Home in Aviation Community!